Amid talks of “time is ripe for amending Kenya’s constitution”, from a technical communicator’s standpoint, a matter of including 3D drafting in the schedules needs special consideration if incidences of misinterpretation are to be reduced, or even maybe completely eliminated. 3D drafting entails using graphical presentation to assist in visualising the concept at hand. 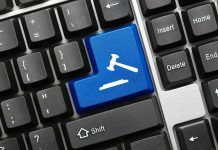 Of course the drafters trained exclusively as legal writers may object because it somewhat alters the traditional appearance of documents. Whereas, we should sympathise with them and suggest that the graphical explanations be appended in the schedules – or be printed separately in an accompanying interpretation manual – the material is necessary and mustn’t be left out. The importance of 3D can be proven when we make attempts to answer contemporary contentious governance questions. Most of them emanate from power struggles or contestations for responsibility among the various State organs as follows. Is Executive the superior arm? Going by the school of thought that believes that the Constitution is written in a manner that gives prominence to the subject that appears first, then the following depiction provides the clear flow of power from the people to all the concerned institutions. 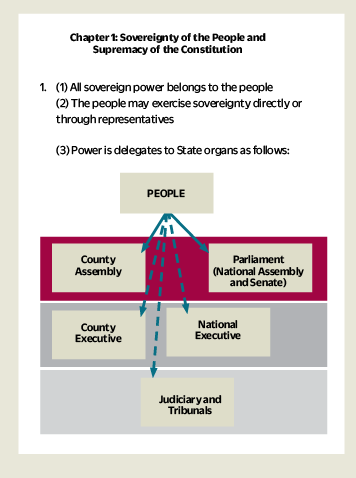 From the graphical presentation, it can be seen that county assemblies and parliament are in the forefront in tapping power from the citizenry. The two branches of Executive come second and therefore have no real power to intimidate others. However, from the school of thought that holds that all parts of a written work are equal and none is privileged by the sequential order, then all the organs are equal given that they draw their powers directly from the people through the constitution. If one subscribes to the latter school then it is indisputable that the two branches are equal as depicted below. 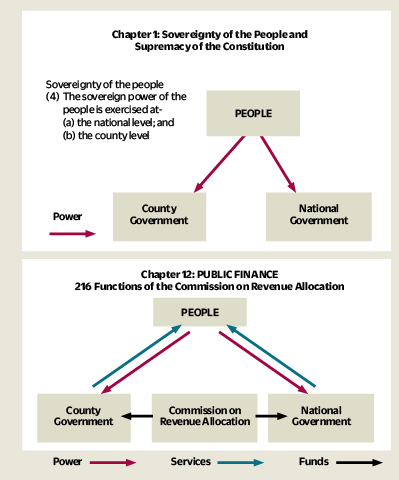 3D helps us to uncover the anomaly that under this Constitution, devolution cannot be the flow of power from national government to county government since both access it directly from the people. However, those in the former school of thought insist that they are merely interdependent and distinct as lettered in the document, and aren’t necessarily equal. The stance is reinforced inadvertently by the use of words: levels instead of branches; and devolution instead of localisation. 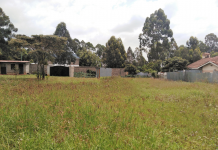 Does National Gov’t GIVE to counties? Here, it becomes obvious that funds are allocated to both branches of government by the Commission on Revenue Allocation (CRA) as provided for by the Constitution. 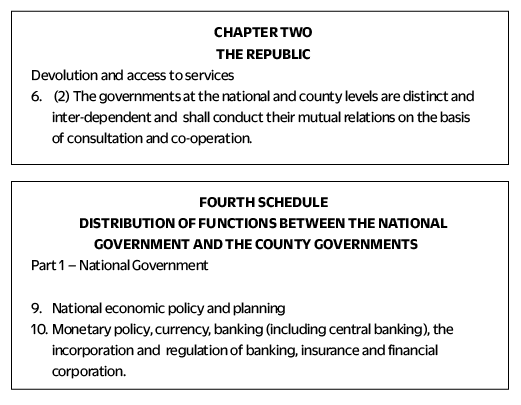 It is therefore erroneous for occupiers in the National branch to boast of funding the County branch, and equally those in County branch of “begging” the National branch for funding. Even in the Fourth Schedule (excerpted above), which delineates the distribution of functions between the two branches, there is no mention of national government being in charge of preparing the budget. 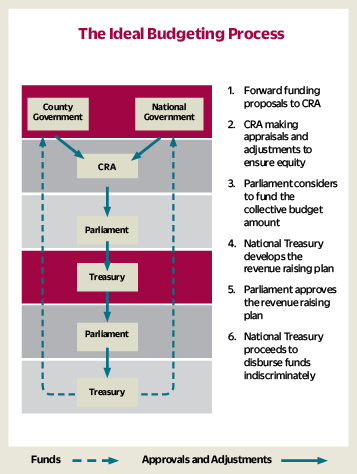 The ideal budgeting process should involve both sides presenting their financial requests to CRA, which subsequently will appraise and adjust to ensure not less than 15 percent goes to the counties and that there aren’t duplications and redundancies in the requests. Then CRA will forward the Bill to Parliament for consideration to fund the collective budget amount. Parliament considers the amount as either adequate and passes it as is, finds it excessive and trims it down, or deems it deficient and scales it up. In the case of an adjusted aggregate budget, CRA acknowledges the new aggregate amount and makes appropriate recommendations to both branches. The summative expenditure is then given to National Treasury for it to develop the revenue raising plan which is again send to parliament for approval. When granted, the Treasury proceeds with the function of funding both sides discriminately.